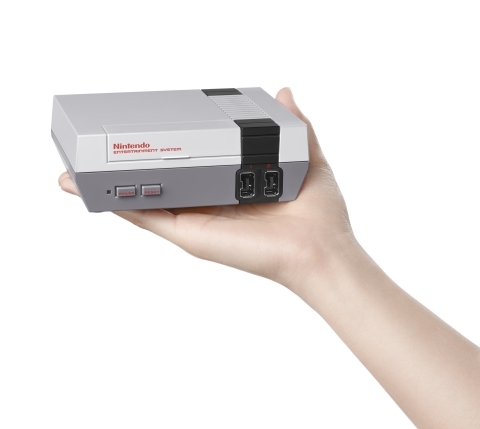 Nintendo intros NES Classic Edition. Nintendo Entertainment System today announced the launch of NES Classic Edition, a miniaturized version of the groundbreaking NES, originally released in 1985. This new nostalgia-fueled system is a near-identical, mini replica of Nintendo's original home console and plugs directly into your high-definition TV using an included HDMI cable. The system comes packaged with an HDMI cable, an AC adapter and one NES Classic Controller, which is patterned after the iconic design of the original NES controller. The console comes complete with 30 NES games built in, including beloved classics like Super Mario Bros., The Legend of Zelda, Metroid, Donkey Kong, PAC-MAN, and Kirby's Adventure. + Zelda II: The Adventure of Link. There's a little something for everyone: a nice mix of timeless favorites, cult classics and maybe even some games that you never got around to playing. Each is sure to bring back memories and produce plenty of new ones. You can even enjoy playing several of these games with two players by attaching a second NES Classic Controller, which will be sold separately at a suggested retail price of $9.99. A Classic Controller or Classic Controller Pro can also be used (each sold separately). When connected to a Wii Remote controller, the NES Classic Controller can also be used to play Virtual Console NES games on a Wii U or Wii system. Playing these retro games using a retro controller makes the experience that much more authentic. And if you ever need to step away from the NES Classic Edition in the middle of a tough level, don't worry about losing any hard-earned progress. Each game has multiple suspend points, so you can start where you left off at a later time, no passwords needed. What's old is new again with the Nintendo Entertainment System: NES Classic Edition. Relive past glories. Finish off that boss you never beat. Save the galaxy and rescue the princess! The NES Classic Edition is launching in stores on Nov. 11 at a suggested retail price of $59.99.